Bhutan Festival Tours (Tshechu) is a religious festival meaning “tenth day” held annually in various temples, monasteries and Dzong throughout the country, celebrated on the 10th day of a month of the lunar calendar corresponding to the birthday of Guru Rimpoche (patron saint of Bhutan). However, the exact month of Tshechu varies from place to place and temple to temple. Tshechu are grand events where entire communities come together to witness religious mask dances, receive blessings and socialize. In addition to the mask dances, Tshechu also include colorful Bhutanese dances and other forms of entertainment. It is believed that everyone must attend Tshechu and witness the mask dances at least once in order to receive blessings and wash away their sins. Every mask dance performed during the festival has a special meaning or a story behind it and many are based on stories and incidents from as long ago as the 8th century, during the life of Guru Rimpoche. In monasteries, mask dances are performed by monks and in remote villages they are performed jointly by monks and village men. 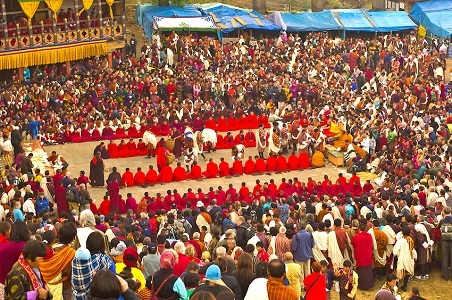 Three of the most popular festivals in the country are the Paro and Thimphu Tshechu and Jambay Lhakhang Drub in Bumthang in terms of participation and audience. Besides locals, many tourists from across the world are attracted to these unique, colorful and exciting displays of traditional culture. It is believed that everyone must attend a Tshechu and witness the mask dances at least once to in order to receive blessings and wash away their sins. Every mask dance performed during a Tshechu has a special meaning or a story behind it and many are based on stories and incidents from as long ago as the 8th century, during the life of Guru Padmasambhava.